This highly intensive preparatory package includes over 425 in-depth multiple choice practice examination questions and test-taking strategies specifically developed for the following testing subjects for your Firefighter Candidate Testing Center Examination – THIS IS NOT GENERIC TESTING! Recall and Comprehend Technical Information from Written Materials - You will receive 4 in-depth practice examinations of over 140 questions for this portion of your exam! *IMPORTANT NOTE: As of March, 2019, we have updated our FCTC exam prep to contain the most current information to help you be successful on your examination! Mechanical Principles to help you excel on that portion of the examination! Watchlist of the Top 150 Fire Departments across the country, featuring addresses, phone numbers and website information so that you can keep current on when departments are giving firefighter examinations. "Practicing with the Recall and Comprehend Technical Information practice material was extremely helpful in me increasing my score from past examinations." 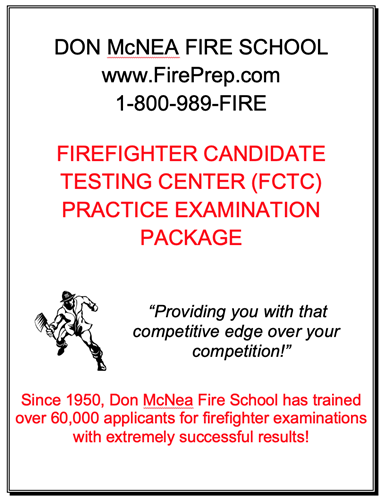 "Don McNea Fire School was extremely helpful in allowing me to score high on all levels of my Firefighter Examination. I am the second in my family to have successful results by using your preparatory materials."